Native American society has been an important part of the culture of the USA since the foundation of the nation. Click here to play! 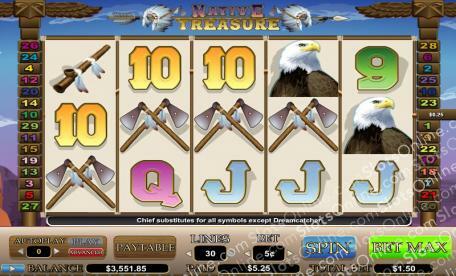 As most people think of Native Americans in regards to the Wild West and frontier days of the US, the Native Treasure slots are themed around the well-known symbols of some of the largest Native American language groups and nations. With tomahawks, peace pipes, dream catchers, girls with plaited hair, and a tribal chief wearing a many-feathered headdress, the Native Treasure slots bring to mind the most iconic images of Native American culture. Play the Native Treasure slots today to think back on the foundation of modern America, while playing for a jackpot prize that could allow you to dictate your own future. The Dream Catcher symbol is the scatter in this game. 2 or more landing on the reels pays out on the total bet, while 3 or more also trigger the free spins feature. In this feature, a giant dream catcher appears and awards a random number of free spins, up to 100, with a double prize multiplier. The Chief symbol acts as a substitute for any symbol other than the scatter symbol.